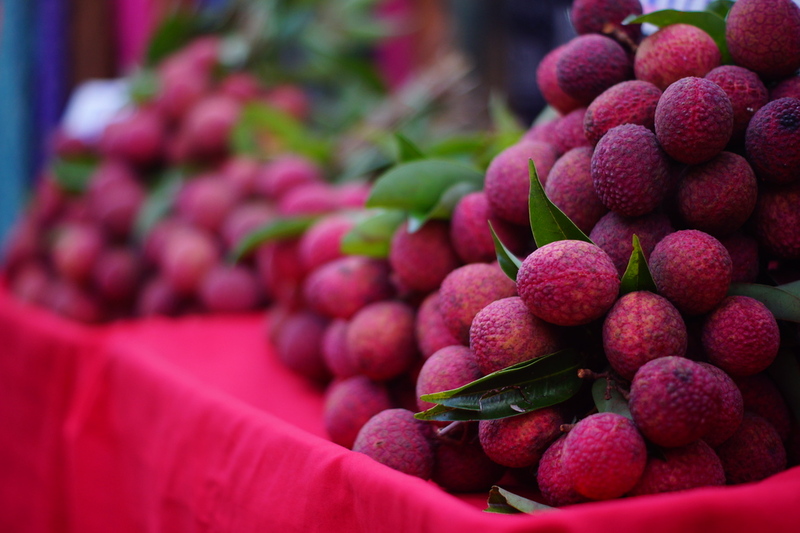 Today’s photo from Thailand is of a bunch of lychee, a subtropical fruit native to SE Asia and China, for sale at the Chiang Mai Saturday night market. Featuring a delicate white colored pulp, this fruit is unsurprisingly sweet with a perfume fragrant. Most tropical fruits in SE Asia are abundantly sweet – just the way I prefer it! We visited the bustling Chiang Mai Saturday Night Market to feast on street food; however, we also noticed stalls selling everything from fruit to small trinkets. Given that the Saturday Night market was just a stone throw away from our Chiang Mai apartment, we ended up going frequently. For those interested, it’s located on Wui Lai road nearby Chiang Mai Gate. To view my entire gallery from Chiang Mai click on the inviting fruit above!